Earlier this year I had the great pleasure of sailing alongside two friends who came out under sail to meet me, when I was on the way to the island where they live. 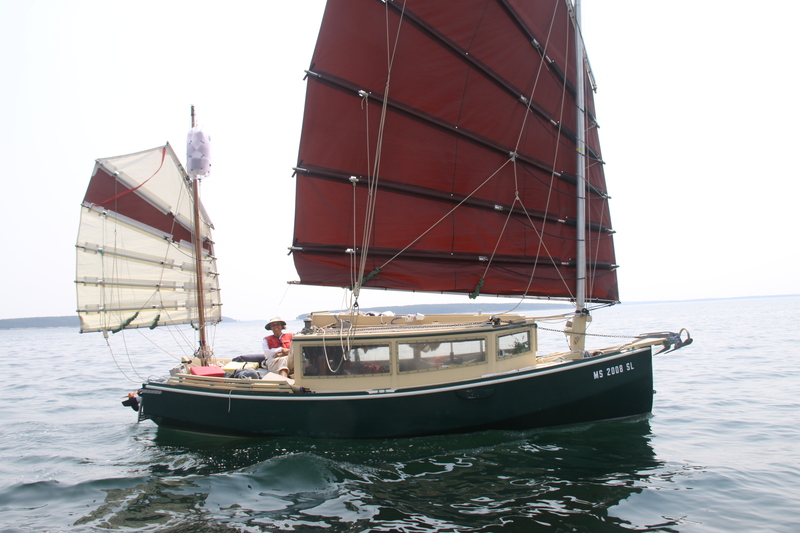 Both took pictures, and I am delighted to be able to share these photos of AUKLET under full sail, with the new junk rig. Now getting toward the end of October, with many months, and hundreds of miles, of travel under sail I can say wholeheartedly that the junk rig is a complete success. True to what everybody says about the more traditional versions of this rig, sailing upwind is not it’s greatest strength. Regardless, I have sailed many miles upwind, including entertaining myself by tacking into or out of narrow harbor entrances against a bit of tide. Going with the tide is of course better, but it was comforting to know that with flat water (and a tremendous amount of tacking), it could be done the other way. Against the tide and with a chop, one might as well not bother to try, but this can be easily overcome with planning and/or patience (the tide always changes!) Though I sure do wish for detailed tide charts for the coast of Maine, like there are for some areas farther south. On those long runs across open water, sailing upwind in 5 to 10 knots is ideal, and upwind is actually preferable, as the boat will steer itself with sails set and tiller fastened, with the boat adjusting its heading on its own for minor changes in wind direction. The boat will steer itself in stronger winds too, but bashing along into the waves isn’t so much fun, and there’s less windward progress as the boat is thrown back by the waves. 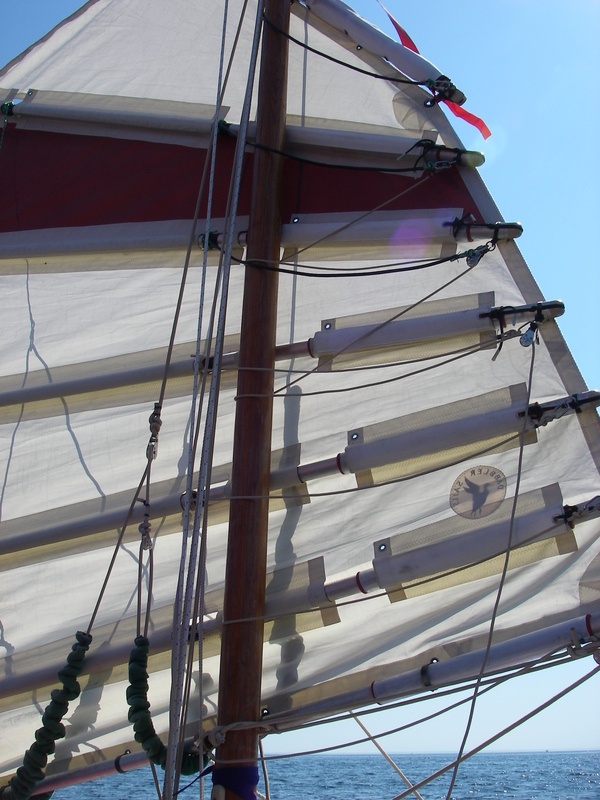 The junk rig makes it perfectly easy to adjust the amount of sail area on each sail, and to tinker with the position of each sail forward or aft on its mast, in order to move the center of effort one way or the other. The boat responds to that, and it’s been fun. All other points of sail are a perfect joy, as far as progress. As mentioned everywhere in discussions of junk rig, reefing is especially easy. Ironically, I’ve found that the effect of such easy reefing is that I don’t reef as early as I used to. 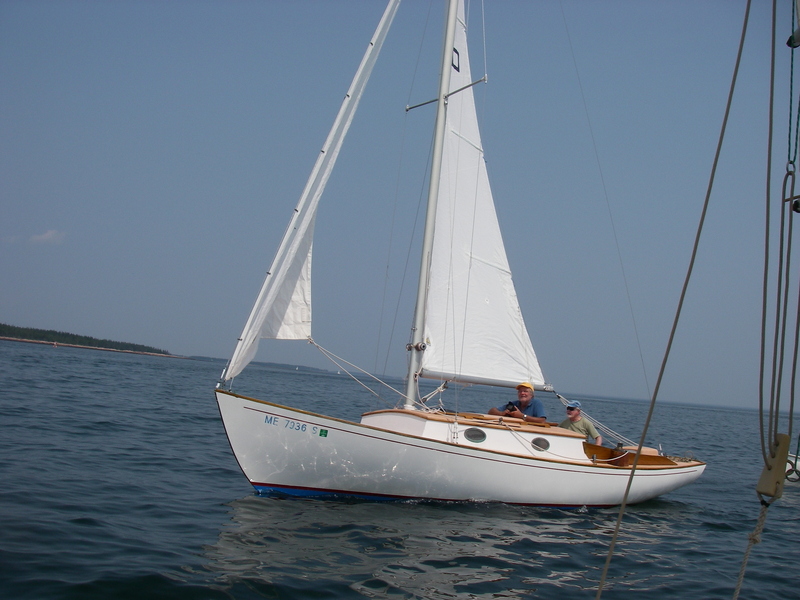 Nowadays I reduce sail based on the angle of heel of the boat, or when going downwind, in response to difficulty steering, as well as for overall boat balance. In the past, with other rigs, I reefed based on those considerations, but even more, based on how difficult it was going to be to carry out the reefing procedure as the wind got stronger. I hadn’t realized just how much that last consideration was playing into those decisions until it became a non-issue. Lately I’ve been having quite a bit of fun sailing with more sail area than I used to for a given amount of wind. 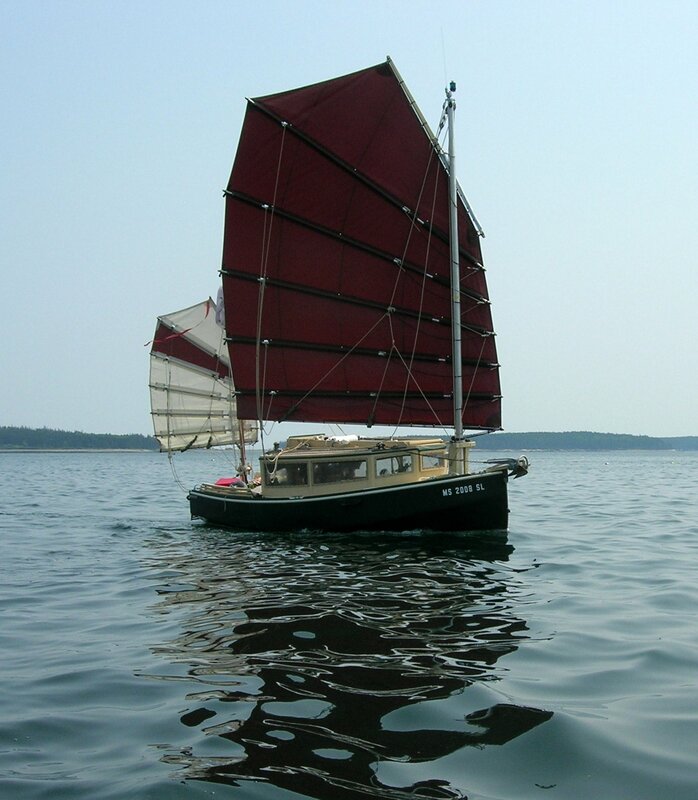 Connected to the above, I’ve been learning that the boat makes much better progress upwind with extra sail area. Because it’s so easy to change the amount of reefing, it’s been easy to compare the effects of one amount of sail area or another – reefing because it seems sensible, observing the poorer upwind progress, and putting that sail area back up, having the opportunity to see the boat make noticeably better headway toward the wind. On the subject of sail area, it’s been just wonderful having these enormous sails. It had been a question during the rig change, whether or not to go with larger sail area, and I debated it both ways for a long time. It was really a coin toss at the end, and I am now very, very happy that the final decision was to go large. 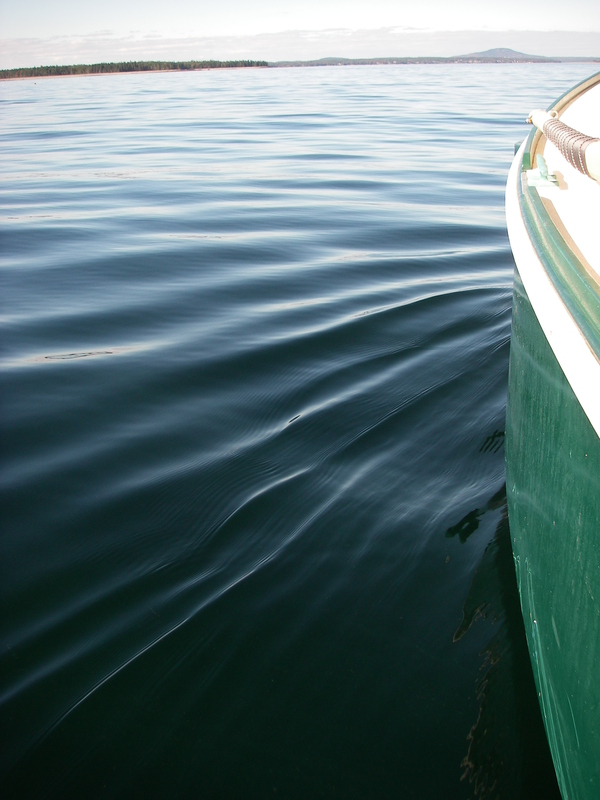 The progress in low wind conditions is significant, showing forward motion when there is hardly a sign of a ripple on the water. The problems I had in the Connecticut River with steering issues, related to the large sail area in following current and shifting, minimal wind, have come up two or three times since then, but not nearly so much as I would have thought. Primarily this occurs when the current is both following and changeable, with eddies and/or shear. The boat will still do pirouettes in very light winds under full sail in these conditions, and it is still true that the problem can be resolved, counterintuitively but completely effectively, by reducing sail area. 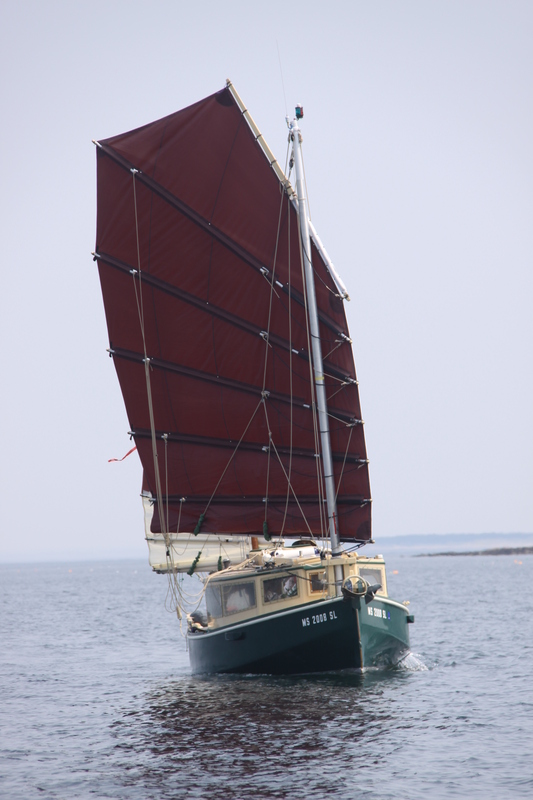 Under most low-wind conditions, the boat simply sails, with the full sail area, and maintains easy steering. It’s a delight. 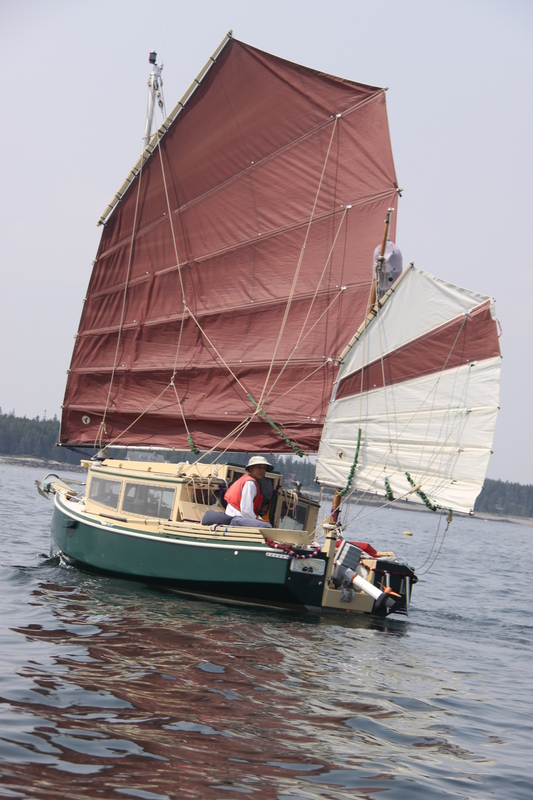 One of the more unique arrangements for this version of the Reddish-style junk rig on AUKLET is the ability to let each sail swing substantially forward relative to the mast. This works using a running tack hauling parrel, a running luff hauling parrel, and standing batten parrels that attach farther aft than normal on each batten so as to allow for this movement. This is described as moving the sails forward for convenience in understanding, but the practical use for this maneuver is when sailing downwind, so that the sails are actually moved across the masts side-to-side, ending up almost centered on the masts in an arrangement a little more like a square rigger. Ordinarily, in sailing downwind with any given sail sheeted out perpendicular to the centerline of the boat, the center of effort for the sail ends up far off to the side, beyond the outside edge of the hull. The effect of this is to make the boat want to turn, pivoting from that pressure off to the side, and this is felt as weather helm, the boat wanting to turn toward the wind. Having one sail out to each side can help to counteract this, but if the sails are radically different in area it’s not a perfect solution. Steering is more difficult under these conditions, and this is particularly noticeable when it comes to using an autopilot, which will typically veer wildly to one side and then to the other of the intended heading. Adjusting the sails across the masts makes a huge difference in this issue. It’s extraordinary to feel the weather helm go away in that one moment, as the sail is eased across the mast by letting out the tack hauling parrel (the luff hauling parrel is left loose beforehand, though it can be adjusted later to take away wrinkles). The autopilot is the most sensitive measure of getting this right. By tinkering with sail area on each sail (reefing), position of each sail across its mast (tack hauling parrel), and the angle of each sail relative to the wind (sheet) it is almost always possible, in a relatively steady wind, to get the boat, at least this one, to steer reasonably straight on the autopilot while going downwind. For somebody who travels distances, particularly single-handing, this is huge. Prior to this rig, on this boat it was almost never possible. In planning for this maneuver, I had originally guessed wrong on the appropriate position for the “windows” in the batten pockets on each sail, that allow for fastening the aft ends of the standing batten parrels to the battens; the standing batten parrels did not allow the sails to come across the masts nearly far enough. This became obvious during sea trials in the fall of 2014, and over the winter we put in new windows and made longer standing batten parrels. The new fastening positions were defined by the position of the attachment for the inner lazy jack on the boom, which it didn’t make sense to cross. This meant that the standing batten parrel on the boom came something fairly close to one half of the length of the boom. 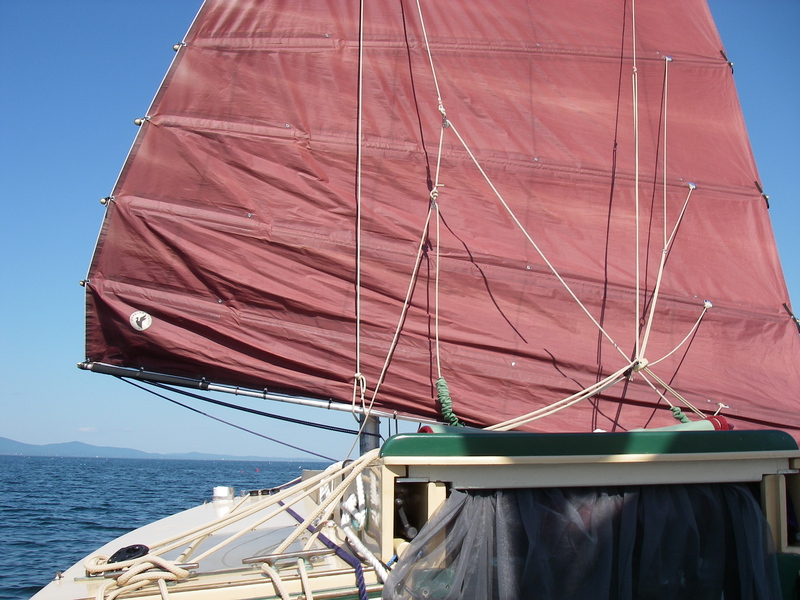 The yard does not change position relative to the mast when you move the sail across like this, so the line of windows angles up toward the halyard attachment, from that deep position on the boom. When this arrangement is put to use, the sail swings across the mast, with the clew dipping toward the water, and the tack rising. It’s extremely helpful to have lazy jacks that adjust from the cockpit, so that the clew can be easily raised away from the waves. I originally thought that having both port and starboard lazy jacks led to the cockpit was a little much, and that one would do the job, with the other fastened. In use, however, it’s been extremely helpful to have both (which I had, thankfully, put in after all). 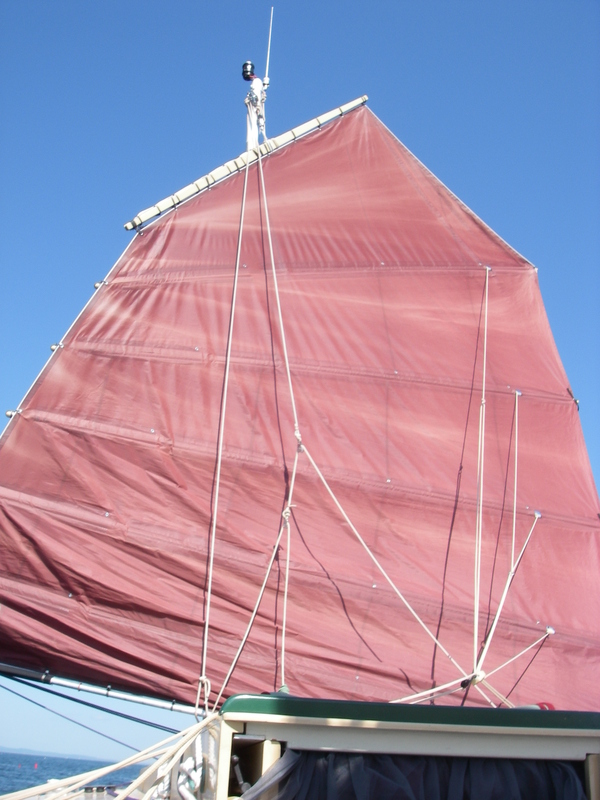 On AUKLET, the original mizzen mast was tall for the size of the new junk mizzen sail, so lazy jack adjustments are not needed when letting the mizzen sail come across the mast. The sail is simply hauled high on the mast with the halyard, and the boom angle is not problematic, being well above both the water and the deck. It’s been interesting to note that when it’s time to jibe the mainsail, one might first think to haul in the lazy jacks to raise the clew. If this has already been done because of waves, then everything is fine and it’s not a question. But in very light winds, when one wants every bit of sail area available, it can be advantageous to leave the clew low, thereby keeping the lowest panels of the sail completely extended. It turns out that it’s much easier to simply haul in the tack hauling parrel temporarily (which raises the clew), bring the sail across to the other side, and then let the tack hauling parrel out again after the jibe is complete. On a boat with a sufficiently high mainmast this would not be an issue, as the sail could be raised high enough on the mast to clear the cabin regardless. In the interest of passing beneath low bridges, the new mainmast on AUKLET was cut to the bare minimum length/height. I would not do this again – an extra 2 feet of height would not have made a difference with the crucial bridges (which, alas, still do not clear), and the additional mast height would have helped enormously for the size of this sail. Still, it all works, if with a bit of fiddling. All in all, the new junk rig has been fantastic. It took quite a while to come upon the opportunity for underway photos of the new rig with sails completely raised, and I’ve been perfectly delighted to see them. 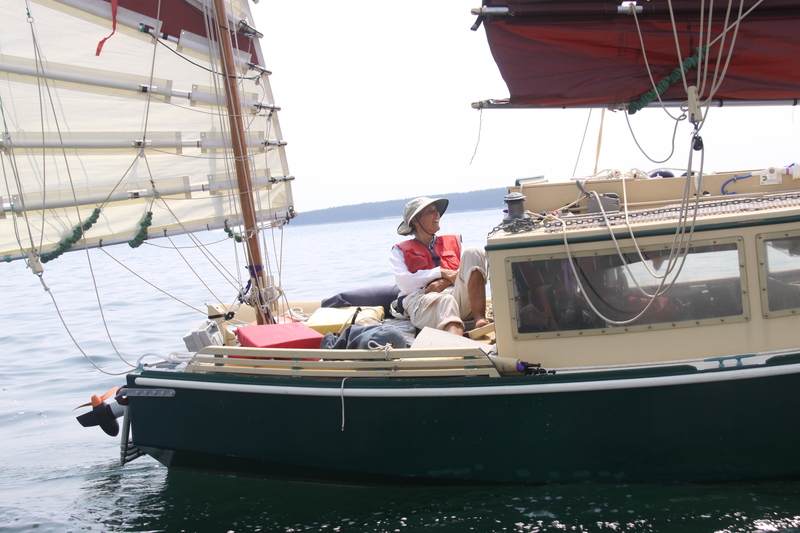 Many thanks to Bill Cheney and to Kent Mullikin for the photos, and for the fun we had sailing around alongside each other! You look great — especially with your smug, arms crossed, “toe hold” on the tiller! Taking a few lemons onboard will not only reduce chances of scurvy, but will help take that smile off you face…..
Great advertisement for a very cool rig! Reefing my own rig is not easy under way, but I confess I quail at the sight of all those strings you have to keep from tangling, though! Out for weeks and months at a time, I suppose you only spend time sorting it all out at the very beginning and end. The easy reefing makes up for a lot – also the gentle jibes. Surprisingly, mostly the many lines don’t tangle, except for sometimes the long tails of the main sheets and sheet spans that fall together in the cockpit. This year when we took the boat out of the water, a week and a half ago now (see next post), all the rigging was taken down after the boat was on the trailer. In the past, I’ve done a lot of that ahead of time at a dock, so the masts are all ready to go, and sometimes folks have been available to take the masts down ahead of time also. Because of the rustic location this time I didn’t want to give up the sail power when it might be truly needed. Doing things this way didn’t turn out to be too bad – about an hour to get the rig sorted out and down, after the boat was on dry land. It’s the initial set up process that can make you cuckoo! That took a lot longer than an hour, but has felt very worthwhile. Wishing you a great winter!